With the 8x8 Hot Desk feature, employees log into a shared phone that immediately behaves like their own extension. They can make and receive calls, and check their messages. 8x8 Hot Desk extensions help employees have a more personalized, secure, and convenient phone experience, whether traveling to other offices or working a shift at a shared desk. For more details on this feature, refer to the Hot Desk User Guide. 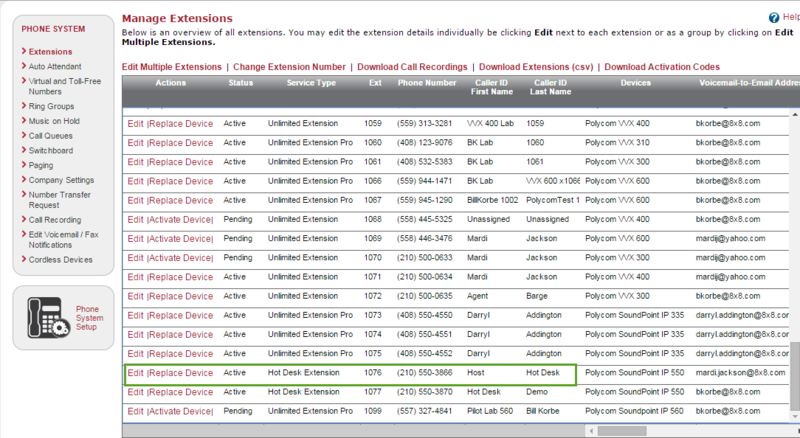 You can configure the caller ID and emergency service address for this extension in Configuration Manager or Account Manager, depending on your organization's subscription. Work with your 8x8 sales agent to place an order for Hot Desk hot lines. Note: If your organization is a Virtual Office Editions customer, you must set up Hot Desk in Configuration Manager. 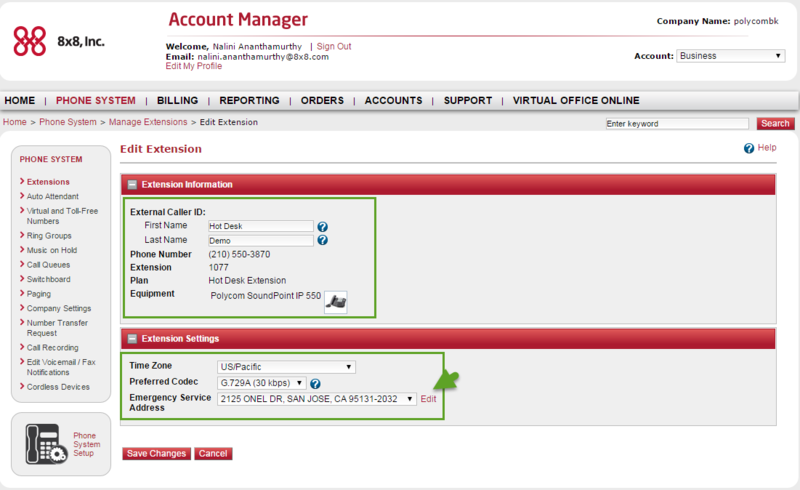 If your organization is a Virtual Office Classic customer, you must set up Hot Desk in Account Manager. Go to Home > Users to create or edit a user profile that is going to be used for Hot Desking. In Services and permissions, select a license that supports Hot Desking. In Voice Basic Settings, select a device and make sure it is activated. The Enable Hot Desk option appears at the bottom of the selection. Note that Hot Deskig is only available on desk phones. If you select a softphone as your device, the Hot Desk option is not available. Click to Enable Hot Desk, and Save. The phone reboots and is ready to be used for Hot Desking. The extension appears as a Hot Desk extension on the phone (in this case, 1077 Hot). Find the Hot Desk extension number, and click Edit. Enter or update the caller ID first name and last name. Click Edit next to Emergency Service Address to change the address. 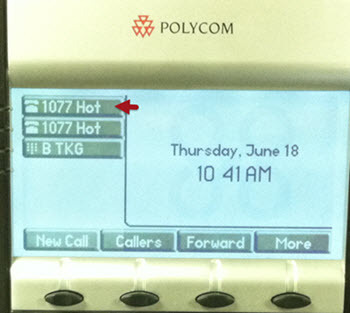 The extension appears as a Hot Desk extension on the phone (in this case, 1077 Hot).